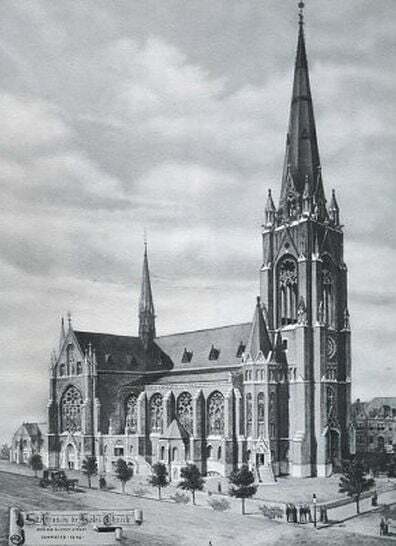 In 1867, St. Francis de Sales Church grew out of the spiritual needs of a burgeoning German immigrant community in St. Louis. Seven German dairymen purchased a tract of land on which to build the new church. With the laying of the first cornerstone on September 15, 1867, St. Francis de Sales began to serve as a spiritual and social anchor for these immigrants in their new homeland. Over the next 40 years, a generation of hopeful new Americans continued to build this church. They first added a school, then a convent, then started to plan the next phase: a grand church as an expression of their Catholic faith. By the 1890s, St. Louis had become the fourth largest city in the United States, after New York City, Philadelphia, and Chicago, and a generation of German and Irish immigrants had set down their roots. Amidst the post-Civil War economic expansion, bustling St. Louis was the proud owner of a new transportation infrastructure and one of the world’s first skyscrapers, the 10-storey Wainwright Building in downtown St. Louis. It was against this backdrop that the parishioners of St. Francis de Sales planned to build a new, larger church to accommodate the bourgeoning membership. Secure in their new country, and filled with hope for the future, what kind of church would they build, for themselves and for future generations? Led by pastor Fr. Lotz, the largely German congregation looked to their ancestral heritage for a set of architectural plans. The cathedral-like church is a story of a growing melting-pot America. In the new country, and in a city named after a benevolent king of France, a German American congregation built a Gothic Revival church under the patronage of a French saint. The imported German architectural design by Englebert Seibertz was modified by an immigrant, Victor Klutho, originally from Alsace-Lorraine. The superb craftsmanship of the ornate reredos at the main altar was the work of another German immigrant, Egid Hackner of La Crosse, Wisconsin. Stained glass windows were designed and crafted by a fine artisan Emil Frei, originally from Bavaria. The interior of the church was filled with emblems of the old country, and the saints venerated by their ancestors. This immense church was built to last. The new St. Francis de Sales church symbolized the hopes and dreams of the immigrants, deeply rooted in the traditions and heritage of their forefathers. It was a brick-and-mortar symbol of American values of the time: faith of the immigrants, beauty and grandeur in the midst of hard work and sacrifice, venerable traditions in a new land, and stalwart hope for the future. Since its dedication in 1908, the fate of St. Francis de Sales church closely dovetailed that of the city in which it was conceived. The population of St. Louis peaked in 1950, and had steadily declined ever since, bringing many changes to the neighborhoods of St. Louis. The latter part of the 20th Century saw many urban renewal projects to counteract these effects, such as the construction of the St. Louis Arch and the gentrification of the Washington Avenue Historic District. St. Francis de Sales flourished when the city flourished, and declined when the city declined. By the end of the 20th century, shifting demographics and suburbanization in south St. Louis left this majestic church nearly empty, and its condition reduced to a shadow of its former grandeur. As the 100th anniversary of its dedication approached, this majestic church faced obsolescence. 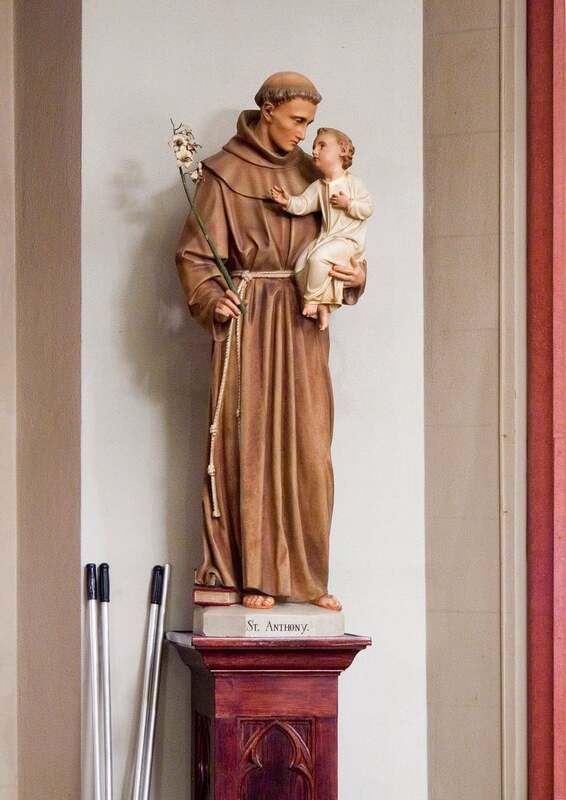 Nevertheless, St. Francis de Sales continues to stand as it was meant to be: a point of reference for many parts of the city, a landmark, a beacon of hope, and a monument to the dreams of its immigrant founders. Its beauty, gleaned from rich traditions of old Europe, is a gift from those who built it to the new generations of Americans to come. Even when dulled by time and neglect, it continues to be a source of inspiration for all.